Today, Hanna owns 600 acres of land in the Sonoma County's Russian River Valley, Alexander Valley and the Mayacamas Mountains. 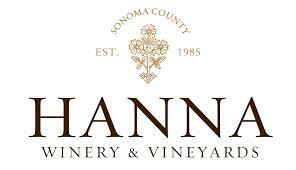 Under Christine Hanna's guidance, the winery has evolved into an estate philosophy that blends the viticultural diversity of fruit cultivated in its four vineyard estates in unique appellations. With the help of Winemaker, Jeff Hinchliffe, Hanna crafts award-winning wines vintage after vintage delivering consistent quality to the consumer.